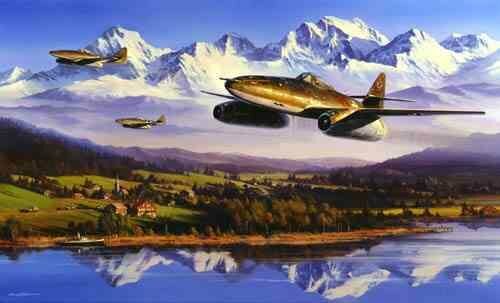 Having just escaped from Munich with the advancing Americans only minutes away, Oberstleutnant Heinz Bär, last commander of JV44, leads his flight of Me262s to their mountain hideaway at Salzburg, 29 April 1945. Later the same day Bär, flying this unique Me262A-1a/U5 equipped with six 30mm cannon, claimed a P47 Thunderbolt in a final act of defiance. A wonderful print that blends the power and beauty of flight with the sheer magnificence of nature.